Discover the heritage of Shumen on an 8-hour tour from Varna. Traveling by climate-controlled vehicle with a private guide, journey to the Madara Horseman and Archaeological Reserve, a UNESCO World Heritage Site. Observe the Pliska National Historical and Architectural Reserve, the Tombul Mosque, and the Communist-era Memorial Complex. Explore, too, the town of Shumen and its local fortress before heading back to Varna. 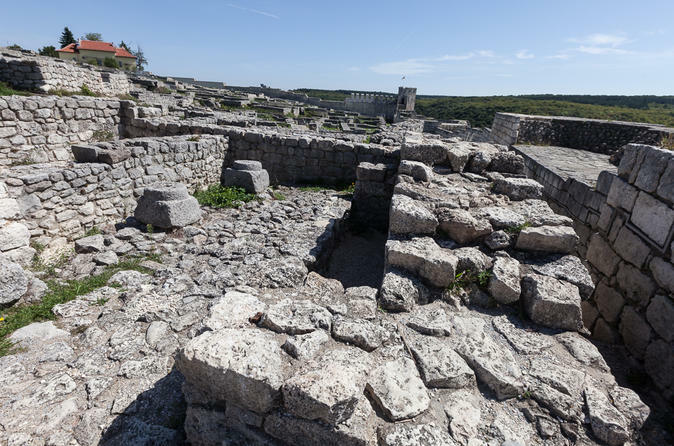 Meet your guide at your Varna hotel at 9am and travel for one hour in a comfortable, climate-controlled vehicle to the Madara Archaeological Reserve. Here, you'll observe a UNESCO-listed rock relief sculpture of a horseman on a sheer cliff that dates back to the eight century. Next, visit Pliska National Historical and Architectural Reserve, the former capital of the first Bulgarian Empire, and wander through the remains of Imperial Palace and other ornamental buildings. Then, continue to the town of Shuman and pause for lunch (own expense). Afterward, visit the Shumen Fortress, located on a high plateau. Peak at the Tombul Mosque before ascending to a lookout point to soak in a sweeping view of the landscape. Explore the Founders of the Bulgarian State Monument, a large and abstract brutalist memorial complex, and take a stroll through the Old Town. Your 8-hour tour concludes with a drop-off back at your Varna hotel.